The project establishes a platfrom where every ordinary citizen is able to monitor transactions of the state treasury, the day-to-day expenses of each institution, by having access to the amount of expenses, descriptions, beneficiaries and clients of state institutions, be it independent institutions, central government, and local government. 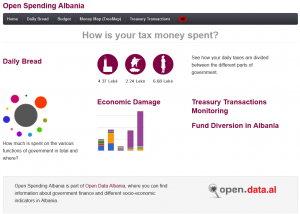 Albanian Institute of Science with its Open Data Albania team, willing to empower both individuals and the Albanian society with information on how taxpayers’ money is spent, has built a new platform known as Spending Data Albania. Through certain applications, the public has the opportunity to learn how each individual contributes through their taxes to the total budget or to specific budgets by sectors. Similarly, an application known as Money Map and Budget provides information on division of budgets by sectors. The most interesting part of the platform is the Treasury Transactions application. This application and the standard of monitoring the day-to-day expenses made by the state administration is a standard that is being offered to the Albanian citizens at a time when countries with much more advanced democracy or models of access to information have not yet managed to achieve. The information provided by this platform is exhausting regarding every state budget from January 2012 until the current weeks. This application, the range of information and its philosophy enables the society, the media, and the citizens to have access to information about the ways the taxpayers’ money is spent, as well as about the public assets, based on the slogan “Public Money is my Money”. The entirety of transactions includes also those expenses and transfers made to those selected through public procurement. We invite the public at large to take this opportunity to inform themselves and invite you to write to us so that we may help you with the technical use of the applications available or by making even more detailed analysis of the Treasury Transaction Monitoring. The goal is to provide a platform where citizens, through several applications, can get information on everything related to public expenditures. Services offered to the public include monitoring of the state treasury; online tax calculation; money map and budget.